Small business search results are at the heart of local marketing for the small, local, retail business. Search marketing, search optimization (SEO) and generating traffic to your small business has numerous components that all work together to achieve results. Local retail marketing within the digital space is not a “set it and forget” exercise, but rather a continual process that utilizes multiple disciplines in order to realize effective search and traffic results for your website. Though search engine optimization requires many detailed functions to be successful, we are going to outline and discuss just a few of them relevant to improving small business local search results and website traffic. Local marketing and retail marketing search results success relies on a few carefully executed elements for any small business. It is important to understand that everything we discuss below must be an ongoing daily, weekly and monthly strategic focus that will improve your retail or local search results over time. All of these components are moving targets that change, evolve and have different requirements for every specific industry, local market and business type. Let’s walk through just a few of the important local search marketing requirements that need to be addressed. There are a few types of website content that are crucial to your local retail website success online. Both of these content items will affect not only your search results and the amount of local organic traffic your website gets, but also what happens when that traffic arrives at your site. Again, there are many crucial elements for effective website content for your local small business website, but we are going to focus on two of them here. Messaging – At the core of any digital property for a small business is messaging. Think of your website landing page as a postcard mailed to your prospective customers. You only have a few seconds to get their attention, provide interest and value, in order to get them to keep reading. If they do not stay on your website, it will be difficult to make a relationship with them and ultimately get their business. What you say on your local website, when and where you say it, makes an incredible difference in the effectiveness of your local search traffic. SEO Content – Often referred to as on-page SEO or on page search optimization, is a large factor relating to where your local website appears in search results. You must not only understand search optimization and how to do it properly. You also need to really understand your target local customer(s), what they are searching for and the kind of content that provides value related to local search. SEO value is determined by search engines using many different factors, including popularity, relevance, comparative relevance to other similar sites, longevity and more. The list of items that determine whether your page or content gets listed high on search engines goes on and on, however they all have to effectively work together to get results. This requires daily, weekly and monthly monitoring, content changes and modifications that effect the search rank position within local search results. Google likes new, fresh, relevant content. The more new relevant content your site has and the more frequently it has new content on the topics your target audience wants, the more relevant your local business website is to Google. If your local competitors are creating new, relevant pages, articles and content on their competing local, retail or small business website, it will improve their search results. At the same time, while their search results continue to increase, your local search results will decline! Consistently creating new blog, website, page and graphic content that is relevant to your business, local market and customers, effects your ability to rank higher in search. In today’s business climate, it is a must to get improved search and traffic to your local website. Ensuring your business is listed on Google and especially Google Maps is extremely important. Using Google my business functions, it is imperative that your local small business is listed, listed properly and connected to your Google Maps page. This allows Google search to also display your local business information within the local search results when users are looking for your local company or what you do. Be aware however, that just having a listing does not ensure that your local business ranks high in search results. It simply means that you are in fact listed in the Google search index. Getting small local business listed high on Google search and other search engine search results is entirely another matter. In order to improve your company’s search results on the major search engines requires boosting your small businesses relevance within Google’s index. One additional requirement for relevancy is when other pages across the internet link to your website, content and pages. The more relevant these other websites are and the more popular their site is, the more “juice” it provides to your local business search results, improving your overall rank on Google. Building links back to your website, content and pages is something that requires an enormous amount of time, patience, strategy and effort. Again, this component of your local search marketing improvement is not a set and forget element, but requires a specific strategy that results in getting your local brand website linked to by numerous other relevant sites. But beware, attempting to do this too quickly, or not using best practices, or even getting links from sites that are fake or not relevant can actually diminish your search rankings, not help them. Finally, recently it has been proven that links FROM your website that link to additional, relevant sites can also impact your search result listings improvement. Linking to high value websites and content FROM your website may seem counter productive, but again it must be done properly with an understanding of where and why you are linking out, if you want it to help your small business search results. As we stated earlier, the items we discuss in this post are really just a few of the components to how to get better local search results. 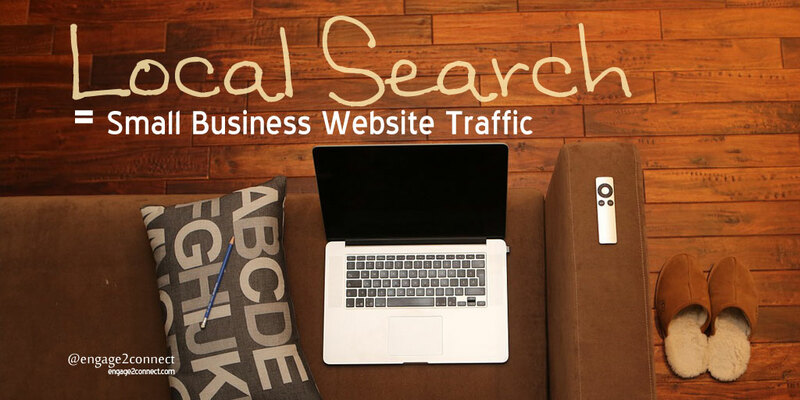 There are an incredible number of moving parts related to improving small business search traffic that go well beyond what we have discussed here. It is important to understand that local, retail and small business search results have become just as intricate and challenging for the small business as it once was for larger brands. The bar is set very high for what search engines consider related to search rank for the small business, and it will continue to get higher, not lower. Need help improving small business search results? We do that!